Vox Noxi is looking for help in finding her friend's license plate. I just had to take part because the license plate is so cool. STOLEN! 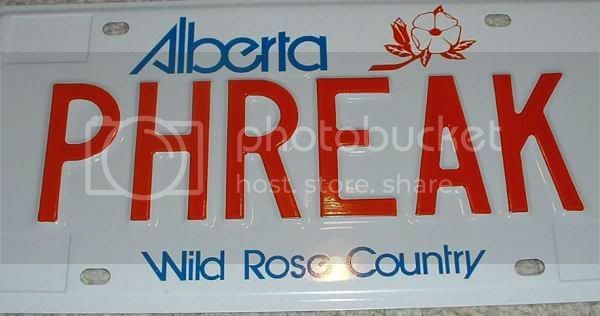 One custom Alberta licence plate: PHREAK. The plate was stolen from the back of a car on the night of Saturday September 24. The car was parked on 13th Street at Cameron Ave SW, just one block south of 17th Ave. The plate was a birthday gift, and stealing it is pretty damn low. There is a reward for information leading to the return of this plate. If you took it and you regret it now that you’ve sobered up, give it back. No questions asked. Contact the owner at (403) 282-0625 or fyrephreak@hotmail.com. Ask for Mark. I know I have some Alberta readers, so get out there. You're awesome. Thank you. I'll let you know if anyone turns it in (or turns the thief in).